Üsküdar University continues to host TEDx, which is one of the most important ideas and discussion platforms in the world. In the program that will be conducted on February; Prof. Deniz Ülke Arıboğan, Prof. Sermin Kesebir, Prof. Nurper Ülküer, Assoc. Prof. Gökben Hızla Sayar and many other academicians will present their speeches about the most interesting issues of their fields under the main concept of “Changing Human, Changing Science”. 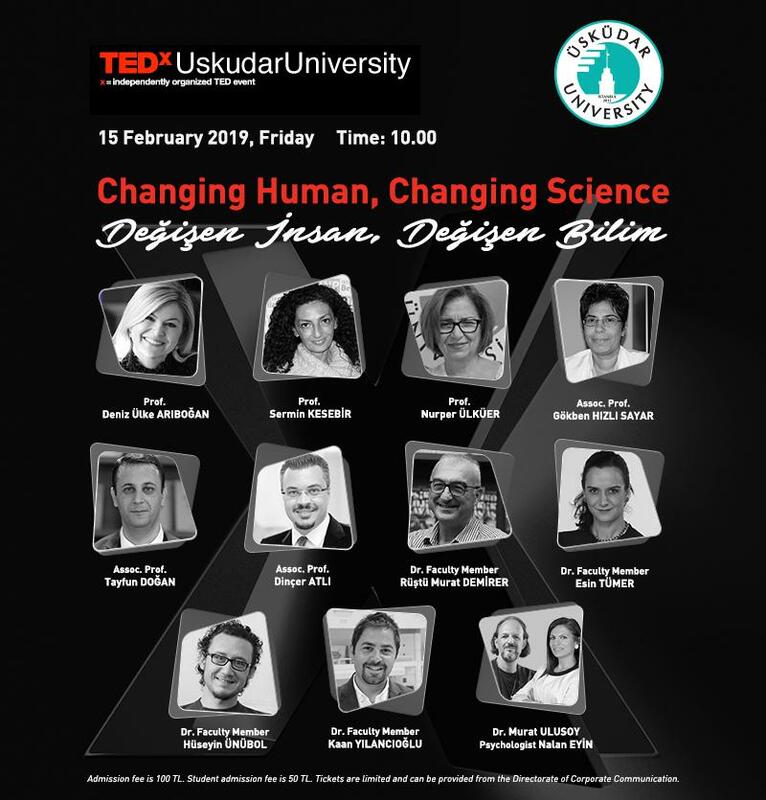 TEDx will be held at Üsküdar University Main Campus Termin Tarhan Conference Hall on 15 February, Friday in order to gather together the academics who are very familiar with the public. Üsküdar University Faculty Dean of Humanities and Social Sciences Prof. Deniz Ülke Arıboğan’s speech is titled “The Walls Surrounding Our World”. NPİSTANBUL Brain Hospital Psychiatrist Prof. Sermin Kesebir’s speech is titled “Psychiatric Disorders Are Also Physical Diseases: Mind and Body”. Üsküdar University Faculty of Health Sciences, Department Head of Pediatric Development Prof. Nurper Ülküer’s speech will be about “A Cup of Love Has Lifelong Deeds on People, Who Drink it in Their Childhood Years”. Üsküdar University Institute Director of Social Sciences Assoc. Prof. Gökben Hızlı Sayar’s speech will be “Developing Creative Minds”. Deputy Dean of Humanities and Social Sciences Faculty Assoc. Prof. Tayfun Doğan will give speech about “Sources of Psychological Well-Being” and Advertisement Design and Communication Dr. Faculty Member Dinçer Atlı will give a speech on “Talent Management’’. Üsküdar University Faculty of Engineering and Natural Sciences, Industrial Engineering Dr. Faculty Member Rüştü Murat Demirer will give a speech on “Will There Be Revolutions in Artificial Intelligence and Big Data Paradigms in The Future?”. Faculty of Health Sciences, Occupational Health and Safety Dr. Faculty Member Esin Tümer will present his speech on “Istanbul! Every Building is Called Residence & Each Room is Separately Smart in Them! The Mind Transformation Before the Urban One!”. Üsküdar University Department of Psychology Dr. Faculty Member Hüseyin Ünübol’s speech will be on “Unhappiness is the Capital of Happiness”. Üsküdar University Faculty of Engineering and Natural Sciences, Department of Bioengineering Dr. Faculty Member Kaan Yılancıoğlu’s speech will be on “Is Mankind Ready For The New-Age Without Antibiotics? Can We Survive?”. TEDx – Üsküdar meeting will be concluded with Üsküdar University GETIPMER Director Dr. Murat Ulusoy and GETIPMER Scientific Advisory Board Member Psychologist Nalan Eyin’s speech on “Sexual Mind, Expanded Sexual Response and Hypnosis’ Why and How Necessary?”.